Peonies can be an attractive addition to a flower garden, but like many popular plants they have a dark side. 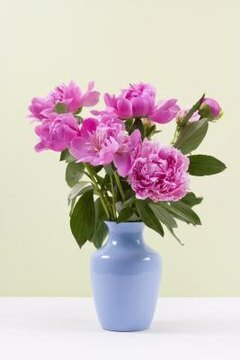 They contain a toxin that can make animals and people uncomfortable and even dangerously ill. Cats, dogs, horses and cows should not be allowed to eat peonies. The peony is a woody shrub that bears large, showy blossoms in all normal flower colors from white to yellow to deepest red, but not blue. It's cherished by gardeners for its impressive blooms and dark, glossy foliage. The peony has been cultivated for centuries in China. Those with yellow blooms were once considered to be for the exclusive enjoyment of the emperor, because yellow was the imperial color. Dangerous poisons can be useful under controlled circumstances. All parts of the peony -- leaves, flowers, seeds, stems and roots -- contain the toxin paeonol, but it's most concentrated in the bark. Traditional Chinese medicine uses white peony root tea for relieving pain, easing cramps, purifying the blood and promoting long life. Paeonol is still being studied for modern medical uses. A cow that eats peonies would probably develop a bellyache, and eventually diarrhea. Although a cat or dog might vomit, cattle vomit only with extreme stomach distention, and it's a very bad sign. A cow might become lethargic after eating peonies and seem depressed. Prevention is your best bet. Fence your garden well to keep out cattle. If a cow does get in and munches on your peonies, she probably won't be affected too seriously -- a big animal would have to eat a lot of them to become really sick. If she's not your cow, tell her owner what she ate. If she's yours, give her plenty of water and hay and watch her for symptoms. If these continue for more than two days, call in the vet. University of Wisconsin: Common Plants, What's Poisonous and What's Not? AgriViet.net: Are Peonies Toxic to Animals?